There is no comprehensive registry of journalists in the nation’s capital providing a definitive database on the changing make-up of the Washington’s Fourth Estate. But media directories and accreditation officials at different agencies and government press galleries offer some sense of the numbers, and the different trend lines at each sketch a consistent, reinforcing story. First, the changes in the Washington press corps did not begin in the last three or four years with the growth of the Internet and the subsequent decline in advertising revenue—let alone with the current economic slowdown. The number of journalists in Washington appeared to peak in the mid-1990s and has been sliding for 15 years. The peak for newspapers was probably closer to 20 years ago. 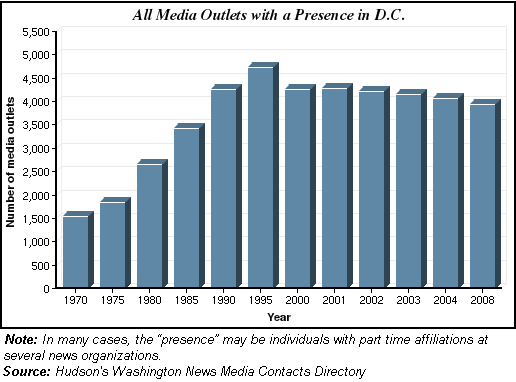 Second, heading into 2008, the number of journalists in Washington was not appreciably different than it was four years earlier, and it remained more than twice the size of the Washington press corps at the time of Watergate, perhaps a high water mark for the prestige of Washington reporting. While, there is considerable evidence of more substantial cutbacks in the last six months of 2008, the real story is in where those journalists work and the kind of coverage they are providing. That story begins with the startling degree to which the mainstream press serving the general public and oriented to covering government according to the geographic lines around which representative democracy was designed has shrunk. First looking at newspapers with bureaus in Washington, of the nation’s 1,400 newspapers, 32—representing just 23 states—had their own bureaus in Washington at the beginning of 2008, according to Hudson’s Washington News Media Contacts Directory. That is half the number of the mid-1980s, when 71 newspapers were representing 35 states. Add, in some additional cutbacks announced late in 2008, the number covering the Obama Administration is almost certainly lower—probably closer to 25. Some might think that this is because more outlets are now represented by corporate bureaus—those representing a chain of multiple newspapers. Not so. In the same time period, the number of papers represented by corporate bureaus in Washington dropped by more than half to 262, down from 551, according to Hudson’s. Among the hardest hit are the regional newspapers from around the nation, those who cover the interests of Washington as they pertain to particular states, communities and regions—and who, more than any other media, do the work of covering specific elected representatives and state congressional delegations and interests. Since the mid-1990s, the rolls of the Regional Reporters Association—a group of Washington-based reporters working for smaller, regional newspapers around the country—have shrunk by more than 60%, from around 200 to 73 at the end of 2008. Looking at this another way—the numbers of individual U.S. reporters accredited to Congress—suggests a similar shift away from traditional newspapers and toward niche outlets and to a lesser degree wire services. 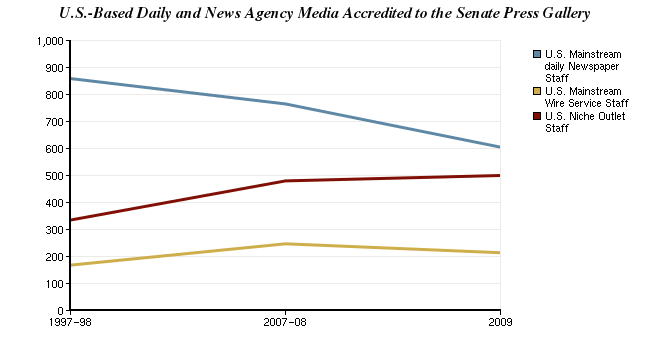 The total number of reporters accredited by the Senate Press gallery to cover Congress actually remained relatively steady from the 1997-98 Congress to 2008-09 (increasing slightly in 07-08 but then declining again in 2009), according to an analysis of Congressional Directories. But the make up of those reporters changed dramatically. Newspapers reporters went from representing nearly two-thirds of the staff in 1997-98 to accounting for less than half of the staff in 2008-09. Staff from U.S. niche publications, on the other hand, increased from 25% of the total staff in 1997-98 (about 335 reporters) to 38% in 2008-09 (about 500 reporters). The number of wire service reporters accredited to the Hill grew for a time, in large part due to expansion of the Reuters and AP bureaus. But then in 2009 they lost some of that gain. In 1998, 167 held Congressional credentials. By 2008, that number had grown to 247. But in 2009, that number fell again to 214. 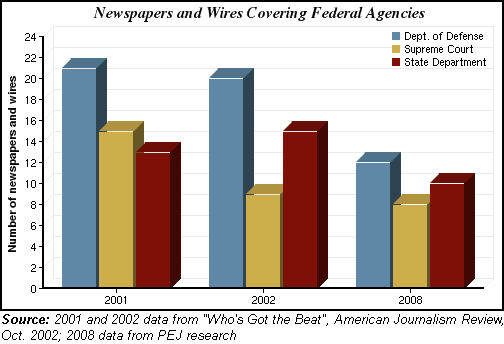 As a result, wire representation overall increased just slightly from 12% in 1998 to 16% in 2009. Overall, the total number of organizations with Hill credentials declined from 165 in 1998 to 149 in 2008 and then 137 in 2009 – a 17% drop. Something similar, though far less drastic, has occurred in local television and radio. Though the amount of Washington coverage used is more limited, the number of local TV and radio stations with access to feeds and news stories from corporate news bureaus in Washington has fallen 37% from the mid-1980s to 92 stations, down from 146, according to Hudson’s Directory. The number of states represented by that number is unchanged at 42. (Nearly all of these are corporate bureaus or syndicated operations serving client stations. Only two local TV or radio stations operate independent bureaus, about the same as 20 years earlier when there were three.) Those few individuals who operated their own news services, such as Mignon C. Smith, whose Washington reporting in the mid-1980s went to as many as 80 Alabama radio stations, also have dropped out of the listings. The numbers are similarly down for the television networks. The number of news executives, correspondents and anchors in Washington for the three traditional broadcast networks has dropped by more than half since the 1980s, according to Hudson’s, from 110 in 1985 to 51 in early 2008—and that was before a round of cutbacks in 2008. Moreover, the sense is that the cutbacks in off-air staff, camera, sound and producers are even greater. Indeed, Hudson’s lists includes 84 executives and correspondents in Washington in its 2008 edition for the six cable and broadcast news divisions, less than the 127 included in 1985 when there were just four divisions (ABC, NBC, CBS and CNN). ABC News, for example, listed a staff of 38 in 1985, with two correspondents assigned to the State Department, three to the White House and three to Congress. In 2008, the directory listed the staff size at 12. Robin Sproul, Vice-President and Washington Bureau Chief for ABC, says part of this shrinkage reflects a transfer of news shows from Washington to New York—Nightline is one recent example—but that economic belt-tightening also has played a role. She estimated the number of Washington-based correspondents had declined by about 20% since 2001. However, as in many daily newspaper newsrooms the bureau has built up staff to provide Washington content for the network’s digital platforms, including its website, abcnews.com, which has gone from zero to eight staff members during the George W. Bush presidency. The most recent hire was just added to cover the Treasury and the economy. “This was an area we had essentially cut out of [the Washington bureau] 10 years ago,” Sproul said. As with executives at other networks, Sproul’s main concern as the Obama presidency begins is how to keep and build on the existing audience for Washington news in an environment of stiff competition from cable, satellite and a growing variety of online competitors—some of which she called “completely unreliable”. “How do we continue to tell the story to people in their 20s, early 30s, and mid-30s? How do we reach them? How do we know where to reach them and how do they know they can trust us? These are the challenges,” she said. The weekly news magazines, another former important element of the Washington press corps has been buffeted by many of the same forces that affect daily newspapers. The two most prominent news weeklies, Time and Newsweek, now operate with less than half the Washington staff they had in the mid-1980s. Time, which at the beginning of 2008 operated with an editorial staff of 14, according to Hudson listings, will end the year with just over half that many. Newsweek, which deployed a Washington staff of 23 to cover the first year of the George W. Bush Presidency, dipped to 14 at one point before rebuilding to 20 as it prepares to cover the early months of the Obama administration. Amid reports that it plans to shift resources more on analysis and more important, but off-the-news issues, the magazine generally has announced more cuts are coming—probably more than 30 from news—though it is unknown who or where. With an overall editorial staff of about 120, the reporting power that the Washington-based U.S. News & World Report brings to these new marching orders is roughly half of what it was eight years ago when George W. Bush entered the White House, although the editorial cuts have been disproportionately aimed at areas outside Washington. All of this means that fewer federal agencies and less of the U.S. government are being regularly monitored. The number of mainstream wire services and newspapers staffing the Pentagon as a full-time beat appears to have dropped from 21 to 12 since 2001. At the State Department, the number has fallen from 15 to 10, and at the Supreme Court, it has gone from 15 in 2001 to eight today. In some instances, such as the Pentagon, the staffing drop could be attributed in part to a less intense volume of news. However, many of the outlets dropping away are those who have suffered significant cuts. There were no comparable independent figures for network television beat reporting, but list of beat assignments provided by the networks themselves frequently suggest a wider net of coverage than government officials say is real. Viewers who think the correspondent they see on air is working a story, developing sources and always on the scene may be laboring under a misimpression. Although network correspondents are listed as covering beats such as the State Department, agencies or even Congress, often they are no longer on scene anymore. Several agencies that did not receive full-tim e coverage from any print outlet by as recently in 2001, such as the Department of Interior or the Nuclear Regulatory Commission, remain without a dedicated beat reporter. The Wall Street Journal, for example, assigns a reporter to the Interior Department, but that same reporter is also assigned to cover the Environmental Protection Agency and the Energy Department. Nuclear Regulatory Commission officials say they are frequently contacted by reporters from the New York Times, the Las Vegas Review Journal and the Atlanta Journal-Constitution, but in each case, these reporters have beat responsibilities beyond the NRC. The number of journalists accredited to the White House shrunk dramatically during the George W. Bush presidency from about 1500 to 800. Those monitoring the numbers, however, attribute this more to tougher accreditation requirements in a post-9/11 world than to any lack of interest. But here too, there are indications financial pressures on daily newspapers play a role. For example, tighter budgets at large dailies have forced cut backs on coverage of out-of-town presidential trips to such an extent that some complain a long-standing White House print travel pool is effectively broken. For years, the pool has covered virtually every presidential trip. Interest in President Obama’s initial months could revive the pool in the short-term, but there is concern that costs could eventually kill it. 1.The Pew Research Center’s 2015 report on the Washington press corps compares the number of newspapers with a Washington bureau and the states they represent between the years of 2008 and 2015. The newer report uses a broader metric to track the changes over time, including a larger number of newspapers in the tally. Those numbers can be found here. 2.The Pew Research Center’s 2015 report on the Washington press corps extends the analysis of niche, wire and newspaper reporters accredited to cover Congress through the year 2014. In doing so, new categories were added to provide a more granular look at the types of reporters on the Hill. In several cases, we reclassified specific outlets into different categories from the 2009 data for trending purposes. Those numbers can be found here. 3. Wire services included here are AP, Reuters and UPI for 1997-98 and 2007-08. As of the 2008-09 Congress, the UPI no longer has any staff accredited. Bloomberg is counted among niche or specialty media. 4. In our February study, PEJ reported different data for newspapers in the Hill press galleries: we reported the number of newspapers accredited to the Hill, not reporters. We have since discovered that in 1989 the Congressional Directories changed the way they reported data for newspapers, though that change in methodology was not noted in the directory. Separate listings for newspapers represented solely by a corporate chain bureau reporter were dropped, with only the corporate bureau left listed. 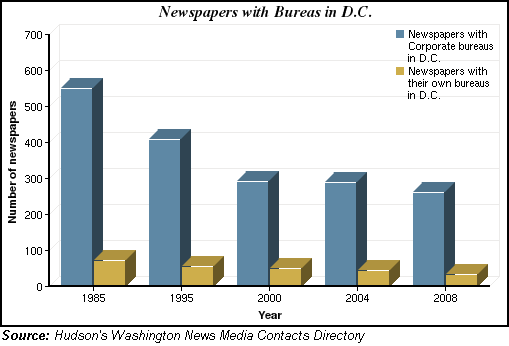 Thus at a time when chain bureaus were beginning to replace individual newspaper bureaus, the directories showed a 72% drop in the number of newspapers on the Hill, which overstates the actual decline. PEJ has recounted the data, identifying each reporter as a way to get a comparable count of reporting strength on the Hill.